Ordinarily when a heralded executive steps down following a great career, it’s a time to celebrate. But the end last week of Ozzie Newsome’s brilliant tenure as the first and only general manager of the Baltimore Ravens instead put the NFL back into a spotlight that is anything but positive: showcasing the lack of opportunity for Black players anywhere except on the playing field. Newsome has been the Raven’s general manager since 2002. He signed a five year extension in 2014, and Ravens’ owner Steve Bisciotti insists he’ll still have a role with the organization next year, even though he’s turned 61. 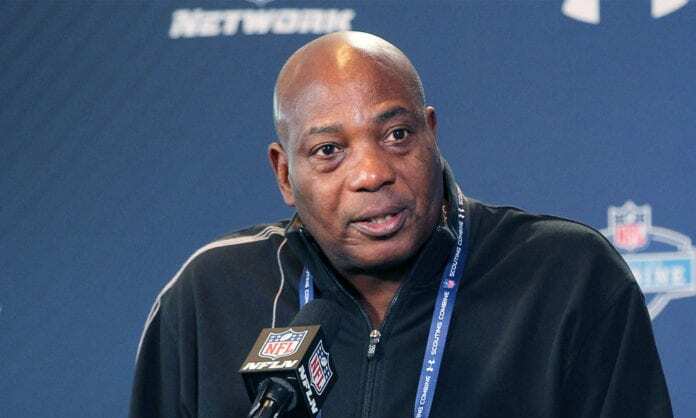 Newsome initially assumed player personnel duties with the Ravens in 1996, and over his tenure built a roster that’s seen them win two Super Bowls. They made the playoffs five straight years from 2008-12, and returned this season after Newsome ignored conventional advice and drafted QB Lamar Jackson from Louisville. Jackson took over when Joe Flacco was injured with the team 4-5, and led them to five wins in their final six games. Despite a playoff loss, he’s clearly their franchise QB for the future. Newsome already had a Hall of Fame resume as a tight end. But he proved himself equally capable as an executive. His first two draft picks were Hall of Fame offensive lineman Jonathan Ogden and middle linebacker Ray Lewis, also a Hall of Famer. But with Newsome gone, the NFL is down to one Black GM, Miami’s Chris Grier, and his status is shaky at best. When Newsome was promoted in 2002 he was the league’s lone Black general manager. 16 years later, the numbers are the same. The NFL has been ducking and dodging inquiries on this subject, telling everyone to wait until all the hiring is done. But at press time there have been five new coaches hired, and all five were white. This comes following a year when five of seven NFL Black coaches were fired. The NFL currently has two Black head coaches in Pittsburgh’s Mike Tomlin and the Los Angeles Chargers’ Anthony Lynn, plus one Latino in the Carolina Panthers’ Ron Rivera. That’s in a league with a 70 plus percent Black workforce. It was 15 years ago that the Fritz Pollard Alliance began lobbying the NFL to do something about what was then a disastrous hiring record in regards to Black coaches. The late Steelers’ owner Dan Rooney proposed what became known as the Rooney Rule, which mandated that any team with an open management position must at least interview one legitimate minority candidate. But that rule has never demanded or insisted any team hire anyone, and the reality is these clubs hire people whom they know and feel comfortable with, almost none of whom are Black or Latino. The latest new twist in coaching hires finds every team seeking a youthful, offensive minded, so-called “quarterback whisperer.” That’s resulte in the same trend for pro football as the analytics trend in baseball. It’s a slew of new faces, almost all of them white. In some cases they don’t even have a track record of accomplishment, as Arizona showed when they picked a new head coach who’d just gotten canned at Texas Tech with a losing record. It’s even harder on the general manager/player personnel side, because owners usually prefer people with front office experience. Not that many former players get the chance to be executives. Newsome was a rarity in 1996, and is still one in 2019. There’s no easy answer to this problem, but until the league really begins taking seriously offering Blacks and minorities executive and coaching positions, there will continue to be little positive change in this area.